You’ll read nothing here about the Chinese stock market. Or Kanye’s 2020 presidential campaign. Or your Sisyphean journey through long-weekend traffic. So buckle up: we’re gonna have some fun. For starters: let’s get you something for that traffic! Say hello to the Oshkosh Joint Light Tactical Vehicle (pictured above), which marries the Humvee’s agility with a tougher skin. For those on a more nostalgic trip, there’s the Woody. 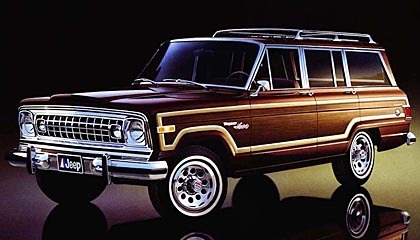 As in, the Jeep Grand Wagoneer, which will be back in all its wood-paneled glory in 2018, almost a quarter-century after going out of production. It’s the ultimate family car of yore, now retooled as a high-end super ute. As long as we’re getting you a new car, you’ll need a new home. May we suggest one of the 10 most expensive U.S. homes available right now? A cool $100 million will get you all 2,538 acres of Michael Jackson’s Neverland. Finally, celebrate your new car and land with a cigar. A Cuban cigar. Legally! Throw in a baseball stadium while you’re at it. Hey, it’s Labor Day weekend.